Deciding whether dental school is the right path to take is not easy, especially if you don’t have any family or friends who are dentists. You may have an interest in dentistry, but how do you know if you’ll actually like the work being a dentist entails? Besides what you experience during your 6 monthly checkups, you don’t have much to go on about what being a dentist actually is like. Before you start preparing your application for dental school, make sure that you are fairly certain that you really want a career as a dentist. There are a few ways you can go about finding out if dental school is really right for you, which we explore below. Ask your dentist and some other dentists in your neighborhood if you can follow them at work some time. That way you’ll be able to get a feel for what a day in the life of a dentist would look like. Shadowing more than one dentist will give you a better idea about how different dentists go about their work since everyone has their own style. 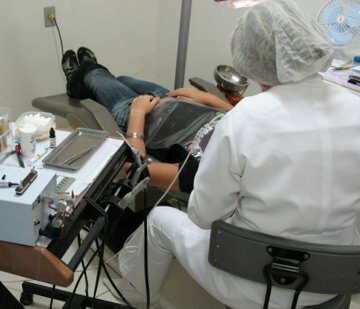 Most dentists will also focus on certain types of dentistry. Consequently, one dentist’s typical workday may be completely different than another one’s. Try to stay out of the way when the dentist is working and if certain patients don’t want you to be observing you can just stay outside. Unless you’ve always been extremely interested in dentistry, you probably don’t know that much about it. Do some research about the history of dentistry and what dentistry is like today. Also make sure that you realize that it’s likely you’ll end up running your own practice, meaning that besides treating patients you’ll also need to run the business end of things, which involves hiring employees, doing marketing, managing finances, etc. If you really don’t want run your own practice, there’s always the option of working for a large clinic though. Read up as much as you can about the dental profession before you make a decision. Visiting a dental school can give you a good feel for what it would be like to study dentistry. Dental schools are usually happy to give you a tour of their campus and answer any questions you may have. Make sure to think of any questions you still have beforehand and write them down so you don’t forget to ask them. Try to talk to some students at the dental school because they’ll have the best view on what dental school is like. Think about what you’re good at, what you enjoy or are interested in and what ambitions you have for the future. If you are considering a number of different professions, listing your skills, interests and ambitions can help you make a decision. If this list clearly shows that dentistry is the way to go, then your decision might be made. If you’re still uncertain however, thoroughly research other options before deciding anything. You don’t want to rush such an important decision. Zane Schwarzlose is a writer and is glad he never thought about going to dental school. How Do You Know If Dental School Is Right For You was posted in Student Careers by Guest Author.